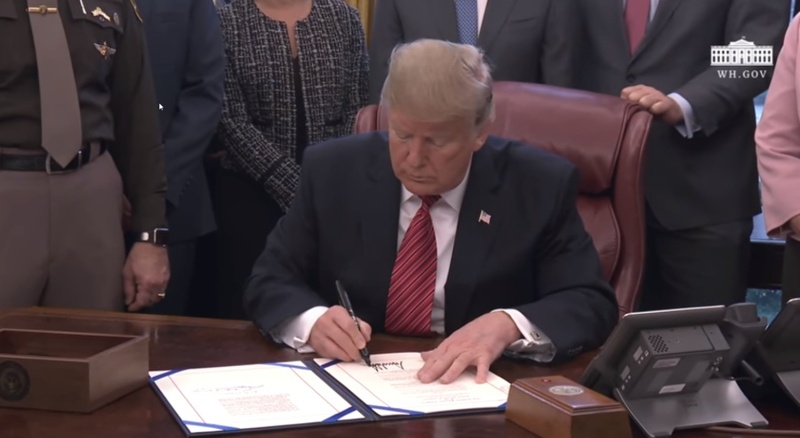 President Trump participated in a signing ceremony for anti-human trafficking legislation on Jan. 9, 2019. This was the last of four anti-trafficking laws signed in the past three weeks. The White House also announced Wednesday that President Trump proclaimed January 2019 as National Slavery and Human Trafficking Prevention Month. President Barack Obama first made this proclamation in 2010. The bills Trump recently signed were needed to reauthorize the Trafficking Victims Protection Act (TVPA) of 2000. The TVPA of 2000 stands as the cornerstone of federal human trafficking legislation. It must be reauthorized every few years, but expired in 2017. The most recently signed version of the law tightens criteria for whether countries meet minimum standards for eliminating human trafficking, or modern slavery. Under the TVPA, the U.S. State Department ranks countries in the annual Trafficking in Persons (TIP) Report by whether they meet minimum standards for fighting slavery. If they do not meet standards, they are ranked on their recent efforts toward that goal. In Tier 1, countries meet the minimum standards. In Tier 3, the lowest, countries don’t meet standards and haven’t made significant efforts to do so. Between stand the rankings Tier 2 and “Tier 2 Watch List.” These indicate those countries that have made recent efforts to improve. Under past versions of the TVPA, it was easier for offending countries to drag their feet on change. Before, a country could lift itself from the worst classification, Tier 3, simply by showing plans to improve. Legislators took a stronger approach this time. Now to move up from Tier 3, countries must show evidence of “concrete actions taken by the country” in the year of the reporting period. Why do these tiers matter? They’re a way the U.S. promotes global accountability for governments to fight slavery in their nations. Every year the State Department issues a Trafficking in Persons (TIP) Report. (See last year’s report here.) The TIP report gives a detailed explanation of the human trafficking situation in each country, along with its tier for the year. It explains what each government has done in the past year to improve. It also provides recommendations for further improvement. In her op-ed, Ivanka Trump highlighted the president’s memo to the Secretary of State on Nov. 29. The memo limits certain types of aid to countries in Tier 3. They can still receive humanitarian aid and trade-related assistance, so long as the aid does not pass through or benefit the government. “The United States is an extraordinarily generous nation, but this administration will no longer use taxpayer dollars to support governments that consistently fail to address trafficking,” Ivanka Trump wrote. Wednesday’s signing took place the day after President Trump’s Oval Office speech on the need for a border wall. He drove the point home again. This time, he highlighted the practical impossibility of stopping traffickers from entering the U.S. without a strong border. “You’ll go hundreds of miles where you’ll see pure open spots,” Trump said. He was referring to areas of the southern border with no physical barrier. Of the 1,933 miles of Southern border, 1,279 miles have no fencing. And the fencing that exists is inconsistent. USA Today documented the entire border with an interactive map. The map also features helicopter videos. One shows fencing that abruptly ends in the middle of marshy Texas land. “The Texas fencing is full of gaps,” USA Today found.